Western water infrastructure was funded in the early and mid‐20th Century with federal financing through the Bureau of Reclamation. Over the last 30 years, federal financing has been less forthcoming, which has been commensurate with an increase in the need for financing rehabilitation and replacement of western irrigation infrastructure. As federal appropriations have declined, there has been increased interest in alternative approaches to infrastructure including public–private partnerships, loan guarantees, or title transfer of federal infrastructure. However, two of these approaches—private partnerships and loan guarantees—are precluded by existing federal budgetary policies, particularly Office of Management and Budget scoring practices. 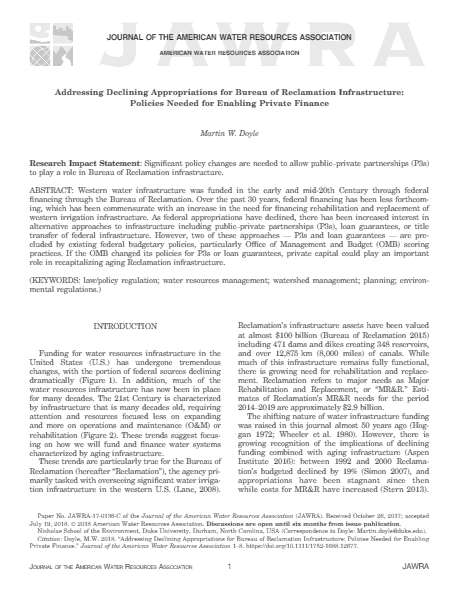 This article in the Journal of the American Water Resources Association suggests that if the Office of Management and Budget changed its policies for private partnerships or loan guarantees, private capital could play an important role in recapitalizing aging Reclamation infrastructure.